Hurricanes Happen! 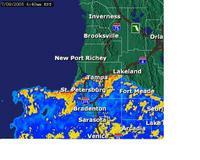 : 7am Saturday - Dennis's outer bands of rain and wind begin! 7am Saturday - Dennis's outer bands of rain and wind begin! A rainy day in Tampa Bay! As I post this the rain has just begun. The storm will pass to our west. When it gets to 27.96 lattitude, we are in the clear for an unexpected and unlikely sudden right turn. Currently it's at 23.9. Meanwhile, I think we'll stay inside today!